We have to talk about what is happening to transgender people when they intersect with race and class. Transgender people in New York City are eight times more likely to live on the poverty line. Brooklyn Community Services (BCS) launched its ONE Brooklyn Community MTA Campaign for the third year on September 12 with “Many Voices, Many Stories,” a public service poster campaign seen on 36 Brooklyn subway stations that features 22 Brooklyn notables including Tiq Milan, a transgender activist, writer, public speaker, media consultant and a LGBT spokesperson for GLAAD and Penelope Ghartey (Penel), who is a 9 year old transgender boy that advocates to live authentically and loves school and karate. The Ambassadors of the ONE Brooklyn Community campaign are using their voices to build public awareness and community engagement for Brooklynites living below the poverty line. Sponsored by Investors Bank, ONE Brooklyn Community “Many Voices, Many Stories” will be on view through October 12th. Although many Brooklyn neighborhoods have experienced a rise in wealthy apartment renters and home-buyers, the current US Census estimates that 23 percent of Brooklynites are living in poverty. Milan and Ghartey join the campaign to raise awareness of the impact of poverty in the lives of LGBT people in Brooklyn. Ghartey is featured on the poster along with his sister Georgia Becker who is an activist and freshman at Oberlin. Ghartey, at the age of three, told his mother, Jodie Patterson, who is a social activist, writer and entrepreneur, that he is a boy, and not a girl. Ghartey lives proudly as a transgender boy and uses his voice to educate others. “I’m happy to be in this campaign because I know that a lot of people will see it and it is important to me,” he explained while sitting with his mother and sister, who have embraced Ghartey, along with their family. A study conducted by the National Center for Transgender Equality in 2016 found transgender youth with supportive families were far less likely to commit suicide or be homeless by nearly 20-point margin compared with those who lacked family support. BCS included Milan and Ghartey in the ONE Brooklyn Community campaign because poverty is an LGBT issue in Brooklyn and throughout the country. Milan and Ghartey are using their voice to continue to educate the public and to let transgender people living in underserved neighborhoods know that they are not alone. 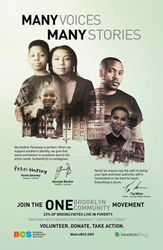 The ONE Brooklyn Community “Many Voices, Many Stories” campaign includes a documentary with interviews with several of the ONE Brooklyn Community Ambassadors that is available on YouTube. The ONE Brooklyn Community “Many Voices, Many Stories” Art Director is Grammy nominated singer, model and writer Maiysha Kai, and the photographer and visual artist is Mark Holthusen. Brooklyn Community Services (BCS) celebrates the strength of the human spirit, and throughout 2017, we continue to celebrate our 150th Anniversary. Our mission is to empower at-risk children, youth and families, and adults with mental illness or intellectual disabilities to overcome the obstacles they face, as we strive to ensure opportunity for all to learn, grow and contribute to ONE Brooklyn Community. To achieve this mission, we offer comprehensive and holistic services: early childhood education; youth development services and educationally rich after-school programs; counseling for at-risk families; treatment, recovery and job training to support the life goals of adults living with mental illness; person-centered rehabilitation and community living support for adults with intellectual disabilities and disaster recovery case management and relief services. BCS also seeks to increase public awareness of the impacts of poverty on individuals and the community at-large. With a staff of over 500 and over 25 sites around the borough, BCS serves 18,000 people every year. Today, BCS is one of the longest serving nonprofit, non-sectarian social service providers in New York City.